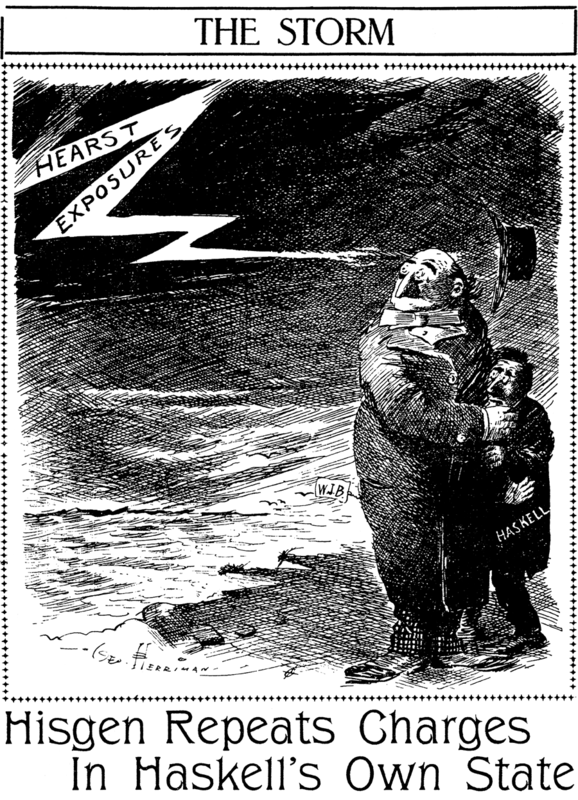 Friday, September 25 1908 -- William Randolph Hearst's hand-picked presidential candidate for his new Independence Party, Thomas Hisgen, takes the anti-trust battle to Oklahoma. Hearst accused Okie Governor Haskell with being in cahoots with Standard Oil, with some pretty damning evidence to back him up. Hearst's Independence Party, despite making a big splash with such stories, succeeded only in fracturing the Democratic vote, the typical sad result of third parties. William Jennings Bryan, running once again on the Democratic ticket, was soundly defeated by Teddy Roosevelt's successor, Taft. Connie, November 6 1938, courtesy of Cole Johnson. Daniel “Dan” Barry was born in Long Branch, New Jersey on July 11, 1923. His birthplace was named in The Art of the Comic Strip (1971) and his date of birth is from the Social Security Death Index. The 1925 New York State Census recorded the Barry family in Brooklyn, New York, at 3409 14th Avenue. He was the youngest of four children born to Samuel, a painter, and Sally. In the 1930 U.S. Federal Census, he was the fourth of seven children. They lived in Long Branch, New Jersey at 29 Grant Avenue. His father was a house painter. At Ancestry.com are the American Jewish Historical Society’s Brooklyn Hebrew Orphan Asylum Records, from 1878 to 1969. Barry was admitted July 6, 1933 and discharged October 23, 1937. At the time, his parents lived at 2836 West 21st Street in Brooklyn. The 1940 census recorded the Barry household in Brooklyn at 2930 West 24 Street. 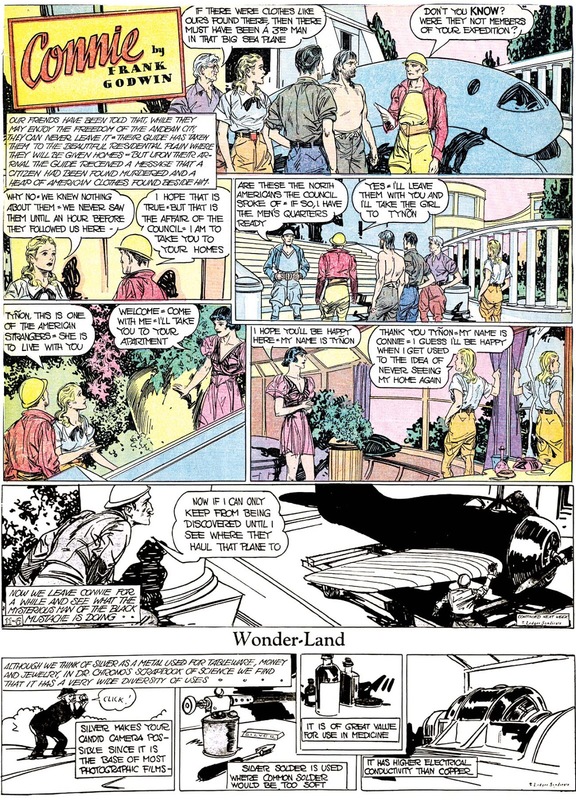 Art of the Comic Strip said, “…He attended Textile High School in New York, and studied under Raphel Soyer and Yasuo Kuniyoshi at the American Artists School. In September of 1941 he met cartoonist George Mandel, who suggested the idea of a career in comics. In August of 1943 Barry joined the army, where he did a comic strip ‘Bombrack,’ for the Air Force magazine. After his discharge in January of 1946 he worked on comic-book features including ‘Captain Midnight,’ ‘Crime Does Not Pay,’ ’Big Town,’ ‘Gang Busters,’ and ‘Airboy’…” From September 1, 1947 to November 20, 1948, he produced the daily Tarzan comic strip; strips from 1948 can be seen at ERBzine (scroll down to the links in the yellow bar). Sy Barry: …Another thing that led me into comics was the fact that my older brother was in it and I saw him making money, and it seemed like an awful lot of money, even though I didn't know that he was doing a lot of pages for that money. (Chuckle.) I mean layouts were like a dollar and a half a page, finished pencils were five dollars a page. My brother worked in a factory. It was actually on a farm. They worked in a barn. There were several artists. He and Lee Ames and Andre LeBlanc and Mort Meskin and several other young men. At that time they were in their late teens or early twenties and they were all in the same boat working in a factory…. Bryan D. Stroud: Right in the infancy of the [comic book] industry. Sy Barry: The infancy, exactly. He [Dan Barry] was only around 17 then himself. He'd left school. He left school when he was 16-1/2 in his last year. He'd skipped a couple of times and he just couldn't see himself finishing school. He didn't have money and was just feeling too despondent and decided to take his art and make some money with it. And that's what he did. He began to work at one of these factories and then he began to get his own work and eventually he worked at DC and that's when I began to work with him when he began to take on some freelance work. I began to help him with backgrounds and I began to do some layouts for him and before I knew it I was getting work myself and so I began to cut down my work with him and eventually got my own accounts. Art of the Comic Strip said, “From 1957 to 1963 Barry lived in Europe, but continued his strips for King Features….” In 1982, he ran afoul of the Internal Revenue Service, as reported in March 24 edition of The Bulletin. 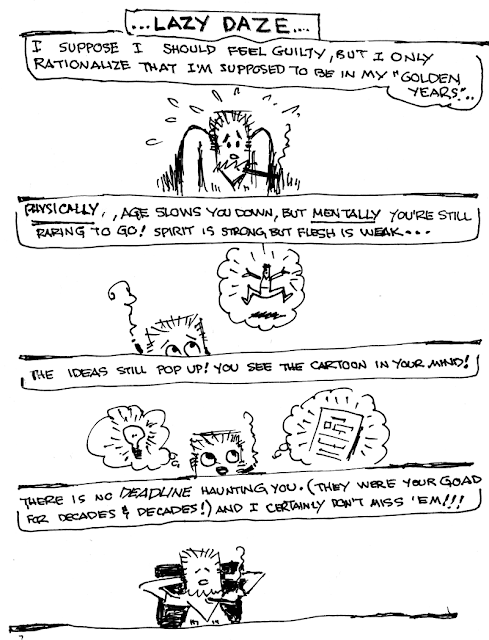 Did you forget he did the Amazing Spifer-Man strip (daily) in 1986? I remember seeing his work on Spidey in the Oregonian. Sorry I incorrectly spelled Spider-Man. Thanks to the dedicated sleuthing of Mr. Alex Jay on that fershlugginer Fulton County Postcards website, we bring to you today a neat obscurity by a well-regarded newspaper and prolific comic book artist, Win Mortimer. Mortimer was a busy bee, working for both Marvel and DC comics in the early 1970s, but somehow found the time to also create a weekly comic strip for the Putnam County (NY) Courier. 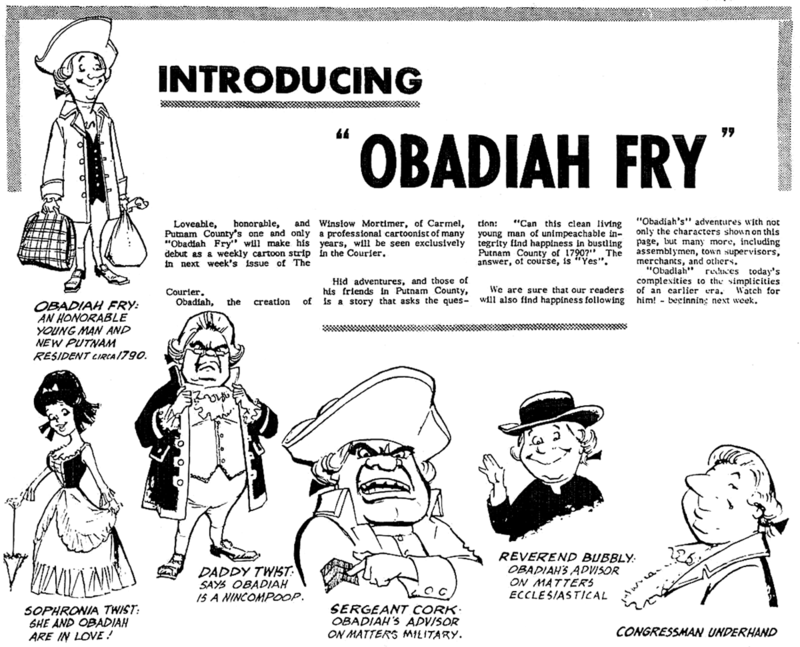 The strip Obadiah Fry was set in colonial America and starred a little fellow with daringly modern ideas. The strip mixed a 1970 sensibility with the world of 1790, and the result was actually pretty good, especially considering this was a cartoonist who was not, as far as I know, generally known for his comedic ability. I could definitely see Mortimer submitting material like this to Crazy or Cracked and easily making the sale. Since Mortimer was an old hand with syndicated comic strips at this point in his career, I imagine he submitted this strip to the syndicates and was turned down. I find that at least a little surprising, as the syndicates were really interested in colonial America at this time, what with the bicentennial coming up. Several strips on that theme sold, and I don't think they had quite the panache of this one. With Mortimer's heavy workload you'd think that Obadiah Fry would have been a short-term experiment. However, the strip began appearing in the Courier on August 11 1971, and was still running at the end of 1975, when the Fulton website runs out of the paper. When they resume their run in July 1978, the strip has disappeared. My guess is that the strip probably ended shortly after the bicentennial, when the whole country was thoroughly overdosed on this colonial stuff. That means that the strip would have had an impressive five year run, a long time even for a weekly. Thanks to Alex Jay for finding the strip and sending me a big batch of PDF samples! Not only countless children, but very many grown persons as well, will be interested in the news that a new Brownie book, Brownie Clown of Brownietown, is to be published next month. in a way the publication may be regarded as a kind of anniversary, for the first Brownies made their appearance just twenty-five years ago. Palmer Cox has been asked on a great many occasions how he came to draw the little elfish creatures that have been so closely associated with his name. So the tale is not a new one; yet there are one or two details which we think are comparatively unfamiliar. Although Mr. Cox was forty-three years of age before he drew his first Brownie, he had heard of the strange people in his earliest childhood. He was born in Granby, Quebec, a Scotch settlement lying within sight of the Vermont mountains. The first settlers of this little Canadian colony had brought with them from Scotland much of the folk-lore of the Grampian Mountains. Of all the creatures that figured in the fairy tales which the women of Granby were wont to relate to their children, the Brownies had the greatest charm for the future artist. Despite their mischievous tendencies these Brownies were held to be the busiest and kindliest of sprites, whose aim in the world was to lighten the labor of tired housewives. They worked by night, each Brownie choosing some farm house whose mistress was noted either for her good disposition or her good looks. In certain regions of Scotland and Canada the superstitious still make it a habit to leave food on the table placed close to a window to induce the industrious Brownie to abide in the house over night. Before he won recognition and success as the historian of the Brownies, Palmer Cox lived an adventurous and somewhat precarious life. At the age of seventeen he left his Canadian home and came to the United States with the intention of succeeding as a business man. After a few years he became convinced that the Eastern States did not offer sufficient opportunities, so he started for California. This was at the time of the Civil War, and as there were no transcontinental railways, Palmer Cox went to San Francisco by way of Panama. the journey being considerably enlivened by the pursuit of the vessel on which he sailed by a Confederate cruiser. In California Palmer Cox found employment in a railroad office, where he achieved no great amount of success. He already felt a strong leaning toward art, and the loss of several thousand dollars in a financial venture went far toward convincing him of his unfitness for a business career. The unfortunate loss leaving him without sufficient money to devote his entire time to the study of art, he turned to newspaper work. In San Francisco he wrote for the Examiner, the Gold Era and the Alta California, at the same time joining the famous sketching club, the Graphic, of which Benoni Irwin, the marine painter, was instructor. Among other members of the club at that time were Marjot, the French painter, Thomas Hill, and Bradford, later celebrated for his Arctic scenes. In San Francisco Palmer Cox remained until 1878, when he returned East and made his home in New York. The Brownie man. Was born in Granby, Quebec, Canada, on April 28, 1840. The town is near the United States border, and from it may be seen the Greco Mountains and the Adirondacks. His father was a pensioner of the British Army, having seen service when a youth in the War of 1812. Early in life Palmer left home, and after a short stay in the Eastern States went to Lucknow, Ontario. After two years he drifted to San Francisco by the Isthmus of Panama, and followed railroading, but in the meantime contributed articles to the local papers, and after a few years his first book appeared. On being encouraged to return to New York and take up the pen and pencil for a livelihood, he reached that city in 1875. His articles for children attracted the most attention, and he took up that sort of literature as his life work, and it was not long until the Brownies made their appearance. The following books have been published: “Squibs of California,” later enlarged and rewritten as “Comic Yarns”; “Hans Von Pelter’s Trip to Gotham”; “How Columbus Found America”; “That Stanley”; “Queer People”; “The Brownies, Their Book”; “Another Brownie Book”; “The Brownies at Home”; “The Brownies Around the World”; “The Brownies Through the Union”; “The Brownies Abroad”; “The Brownies in the Philippines”; “The Brownie Primer”; “Brownie Clown in Brownie Town”; “The Brownie Year Book”; “Calendar”; “Portrait Gallery,” etc. Mr. Cox has also produced two Brownie plays, one a spectacular extravaganza, and the there a cantata for children. He has traveled extensively in America, and through Europe, visiting England, Ireland, Scotland, Holland, Belgium, Germany, Switzerland and France. Address, 134 W. 23rd St., New York City. Palmer Cox Made Fortune by his Quaint Conceits. End Came in the Canadian Town of His Birth. Palmer Cox, the creator of those mischievous little elves, the Brownies, who have delighted children the world over, died to-day at his home in Granby, Quebec, according to word received by friends here. He was 84 years old and had only been ill for a short time. Death came to Mr. Cox in Brownie Castle, his famous home, which was the wonder of the village of Granby. Mr. Cox was born in Granby and was a graduate of the Granby Academy. In 1863 he went to San Francisco and engaged in literary work there. He was a born draftsman, always making pictures, in addition to writing. His first book was published in 1875. Soon he came to learn that he was most successful at children’s stories. After publishing several books of children’s tales he bethought himself of the Brownies. Taking to definition from the Encyclopedia Britannica, he made his queer little characters conform to it. And those were the characteristics of Palmer Cox’s Brownies. After he began to be famous with his little folk he cams to New York. Later in his life he returned to Granby and built his castle. On his seventieth birthday all the children in Granby trooped to his home to pay their respects to the only “Granbyite” to ever win fame and fortune. Before they went they wrote him postcards containing their conceptions of the way he should have drawn the Brownies. During a big feast he had prepared for his little visitors the mail came in and the cards, with every conceivable form of Brownie pictured caused gales of merriment. Cox never used a name for a single Brownie, but each was named by his character and was known individually. There was the Indian, the Scotchman, the dude, Uncle Sam, Eskimo, Irishman, Turk, student, policeman, sailor and many more, thirty in all. Palmer Cox, caricaturist (b at Granby, Qué, 28 Apr 1840; d there 24 July 1924). At the age of 17 Cox left Granby to work in Massachusetts (1857–59), Ontario (1860–63), California (1873–76) and New York City (1876–1904). He had published his first caricatures in California, but it was the appearance of the Brownies, elfin characters derived from Scottish lore, in the noted American children’s magazine St. Nicholas in February 1883, that launched Cox’s career. 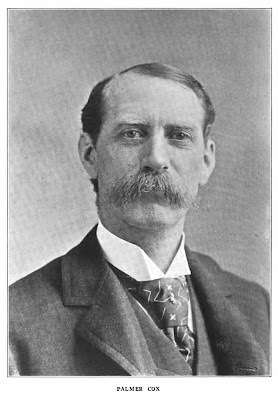 He would publish 15 books of the Brownies’ adventures from 1885 to 1918 as well as numerous stories in St. Nicholas (1893–1914) and Ladies' Home Journal (1891–1910). The Brownies appeared in their own theatre company and on toys, games, porcelain, cutlery and numerous advertisements, the most notable product being the Brownie camera launched by Eastman Kodak in 1900. Cox retired to Granby in 1904, where he had constructed his Brownie castle. "Town Hall Tonight" by Harlowe R. Hoyt includes an account of a local production of a Brownies musical in 1896. Cox had written the book and lyrics; scripts, costumes and a director were provided in a package deal to the local church group. Also, one of WWII-vintage "Moffat" books by Eleanor Estes has its small hero playing a game called "Find the Duke in the Palmer Cox Brownie Book", evidently still on library shelves at that late date. The "Moffat" books themselves are still in print. One of their less glorious firsts was that they were also the first to misappropriate a comic character. In early 1894 cartoonist/technician Charles Saalburg began a series in the color section featuring the Brownies, those stupendously popular characters of the late 1800s created by Palmer Cox. Apparently Mr. Cox was not consulted about this endeavor, because it wasn't long before the Brownie characters vanished and were replaced by a similar but not too similar group of impish characters, the Ting-Lings. Although I have no proof that the Brownies characters were used without permission, the fact that Cox received no credit, the drawings were done in-house, and the quick disappearance leave that as the obvious conclusion. All that is preamble for the series we're actually discussing today, The Brownies Abroad. In 1898, just four years after the copyright infringement debacle, the Chicago Inter Ocean became one of the few newspapers to print this Palmer Cox series, which was offered in a run of twenty weekly installments. 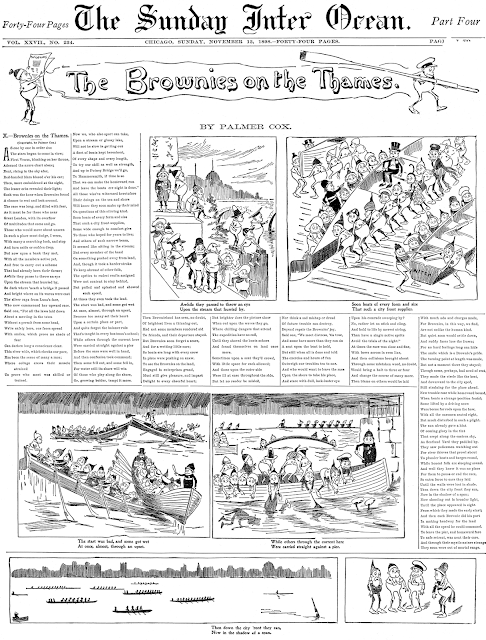 The Brownies Abroad was soon after published in book form by The Century Company, but if you were an Inter Ocean reader, you got the whole book's worth free with your Sunday papers from September 11 1898 through January 11 1899. For the record, though this series is awfully text-heavy to be considered a comic strip, I'm giving it a pass for its historical interest. * These firsts are of course for color printing that was produced on the high-speed newspaper presses. Newspapers occasionally offered color items before this, but they were produced weeks or months ahead on low-speed color presses and later added into the newspaper as inserts. Thank you for those links Francis! I've amended the post. That's the beauty of "retirement" -- you can "work" when you want. Keep 'em coming... at YOUR pace!